The Easter cactus is a popular household plant that is named after its tendency to produce blossoms in the springtime, right around the Easter holidays. Alongside its cousins the Christmas cactus and the Thanksgiving cactus, the Easter cactus is of several varieties of holiday cacti, a group of plants that are often gifted during holiday seasons. With the right care, an Easter cactus can live for decades and add a unique touch of color to any home during the springtime. The Easter cactus, or Hatiora gaertneri, is a succulent that originates from the southeastern coast of Brazil and was named for Joseph Gartner, and influential German professor of botany in the mid to late eighteenth century. The cactus is composed of jointed, flattened segments that are free from spines so that you, your kids or your pets don’t have to worry about any accidental pokes or pricks. Instead, the edges of each segment are ringed with purple fringe that is harmless to the touch. Neither the plant’s segments nor its flowers are poisonous if accidentally ingested by humans or pets. Under ideal conditions the Easter cactus flowers each year around late April or early May, producing flowers that are prized for their unique starburst shape and crimson color. The rest of the year, gardeners can enjoy the cactus for its pleasant light green color. As each plump plant segment matures, it becomes darker in color and may change shape. Fully grown segments don’t usually reach more than three inches in length, but the plant itself has been known to grow to heights of over two feet. The Easter cactus is a relatively low maintenance plant that’s particularly adept at growing indoors. Proper care can help your cactus to grow faster and produce healthier, more vibrant flowers in the springtime. The Easter cactus prefers moderate light and should be kept out of direct sunlight. This plant also prefers warmer temperatures ranging between 75 and 80â. In winter months, store your cactus at between 45 and 65â and keep it in darkness for at least 14 hours each day. This helps to induce flower buds to develop in the spring by mimicking natural climate patterns. Easter cacti need moist soil, but be careful not to overwater your plant. Soggy soil or standing water underneath your cactus can lead to pests, rotting, and disease. A good rule of thumb is to moisten soil with just a little bit of water when it starts feeling dry to the touch. Your Easter cactus plant also needs a humid atmosphere to stay healthy, which probably comes as no surprise considering the plant’s tropical origins. You should mist your plant with water each day to prevent it from becoming too dry. Easter cacti not only tend to grow better in gritty soils- they thrive in them. Easter cactus plants grow best in a 1:1 mixture of potting soil and pumice, bark, perlite, or builder’s sand. For optimal growth, you should also add fertilizer once every two weeks. When repotting, you should wait at least a month after flowering has finished so as not to stress the plant. Shake off the loose soil around the roots before immediately transferring the cactus to its new pot, trying to minimize the roots system’s exposure to light. If you want to propagate your plant, simply remove a couple of mature segment from the cactus and allow them to harden for about two days before planting in a pot filled with moist perlite. You can learn more about how to propagate your Easter cactus from the experts at Desert Plants of Avalon. 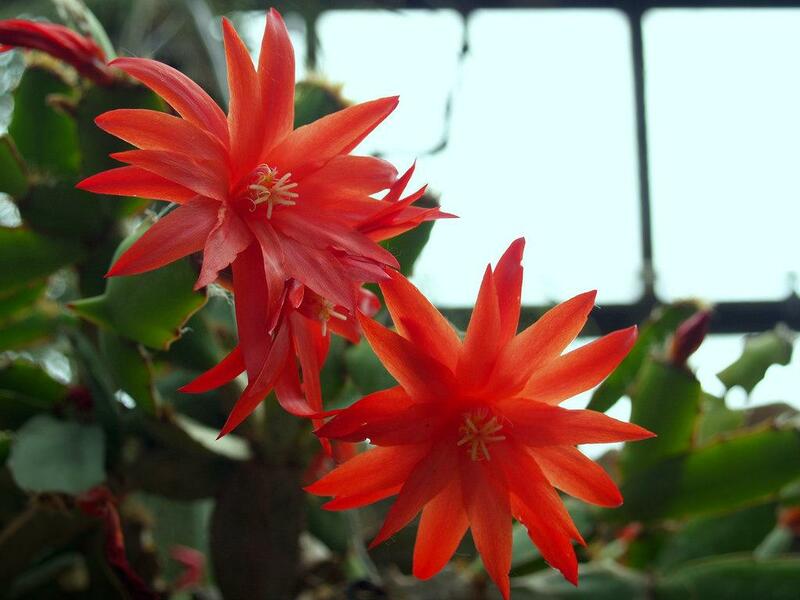 In the late springtime, you may see your Easter cactus burst into exotic, bright red, star-shaped flowers. The blossoms close at dusk each evening, reopening when the sun hits later on in the day. Unlike other holiday cactus varieties, which may bloom for or five days at most, Easter cacti have blossoms that continue to open and close for up to two weeks each year. Flowers can develop into oblong, seed-bearing fruits if fertilized, but this is unlikely to happen with an indoor plant. If you do find yourself wanting to cross-pollinate your plants, you can learn how to do so by hand from our friends at Desert Plants of Avalon. Some people find it difficult to get their Easter cactus to flower, and this often comes down to improper seasonal care. Low levels of moisture and cooler temperatures that mimic fall and winter conditions are necessary to trigger the production of fresh buds in the spring. Moving your plant to a cool room around January and limiting its exposure to sunlight imitates winter weather and increases your chances of seeing big, beautiful flowers a few months later. After your cactus has finished blooming, it needs to go through a month-long resting period. During this time, you need to restrict your plant’s access to water and refrain from fertilizing it every two weeks. After the month-long period is up, you can resume your regular care schedule. One of the most common mistakes that the owners of Easter cacti make is to disturb the plant during its rest period after blooming. While it might seem to make sense to provide your cactus with extra water and nutrients during its recovery period, excessive watering or the addition of fertilizers during this time can disrupt your plant’s blooming cycle. Under-watering or over-watering your cactus can also create unwanted health issues. If your plant doesn’t get enough water, it will dry out, turn yellow, and collapse. The moment you notice this starting to happen, you should begin to incrementally increase the amount of water that you give your plant over the course of a few weeks to avoid stressing its system. When you hit the opposite end of the spectrum and accidentally over-water your cactus, you may see segments starting to swell and break away at the joint. If this happens, don’t worry. Simply decrease the amount of water you’re giving your cactus, only hydrating the soil when it dries out. You can even re-pot the broken segments and propagate a whole new plant!